What Is 5G and How Will It Be Better? Over the years, the internet has grown to become exceedingly fast and we do almost everything online. There was a time when it was almost frustrating having to wait for a page to load but today it has become much better. Most internet service providers are working harder to develop very fast internet access. People can easily get access to the internet using their smartphones, smartwatches, cars and even at home. To get more out of the internet, we now have the 5G wireless connection. The 5G internet is quite similar to its predecessors the 4G and 3G internet connections. It is a wireless connection that promises to link a lot of devices to the internet. We now have regular devices like security cameras, dog collars, home lock etc. that can easily connect to the web. In this article, we will explain how the 5G wireless internet works and what it promises to offer in the near future. What is the 5G Internet? The 2G service could only support calls between two devices and text messaging. The 3G internet allowed people to surf the internet, send messages, receive and make calls while the 4G network was a slight advancement from the 3G network. The 4G wireless connection allows users to do the same functions as the 3G with an added advantage of being able to download and upload very large videos without difficulty. There was an advancement to the 4G network when the LTE version was introduced. The 4G LTE was the fastest network service. The 5G promises to build on the legacy of the 4G LTE internet allowing people access to calls, text messaging and the fastest data transfer rate the world has ever seen. This network will give people the fastest internet service as it will allow users to download and upload large files like 3D and 4K videos. If you compare the 5G network to the 4G LTE, you would experience an internet as fast as a lightning bolt. How fast is it really going to be? The 4g LTE has been able to download files at a rate of one gigabit for every second which would mean that an HD movie is fully downloaded with an hour. The problem however with the 4G LTE is the complaints of interrupted downloads which is as a result of signals from either other Wi-Fi, microwaves etc. 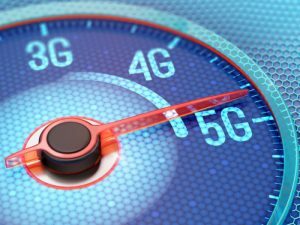 The 5G, on the other hand, will be able to fully download a file of up to ten gigabits within a second also it solves the problem of interruption faced with the 4G LTE. This new network will effectively reduce latency to deliver faster download times. It is also expected that the 5G will have enough wireless broadband power to connect devices that are both at home and in the office. The 5G network hasn’t been released officially but is currently been tested. It is presumed that the 5G service will be made available at least by 2020. Most people agree that this wait is what the while as we all look forward to faster internet access. People are looking forward to a future where we will be able to connect billions of devices together and the possibility of the fastest internet access which the 5G is sure to help us achieve.